As our bus approached the border between Cambodia and Thailand, the countryside got trashier. Cambodia was a much poorer country than Thailand and the people were more desperate as they attempted to sell things. Matt was here five years ago and was amazed by how much the country had advanced. Last time he passed through the border crossing he was with one other tourist and the border guards were smoking and playing cards. They bargained over the price of the more expensive “fast” or the cheaper “slow” visa, which they claimed would take four hours to process. Matt told them he’d sit down and wait for four hours. They closed their window but after a few minutes opened it again and said “No slow visa, only fast.” So Matt was forced to fork out the extra “fee” (bribe money) to get his visa and be on his merry way. Wanting to avoid this corruption, we purchased our visas online this time. In the end there was no need for this. When we arrived, Matt was shocked at the hordes of tourists lined up at the visa processing windows. Everything seemed to go smoothly for everyone and there was no sign of corruption. Not only that, but the road we took to Siem Reap was paved. What took us three hours to complete had previously taken Matt eight hours on the bumpiest ride of his life. 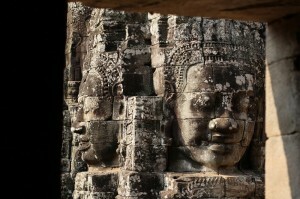 In the past five years, Cambodia has paved it’s most traveled roads, making it much more tourist friendly. Driving through Cambodia, there were moments where we could have been in Iowa. The land was incredibly flat, with fields stretching as far as the eye could see. But then a random bunch of banana trees would pop up, bringing us back to reality. 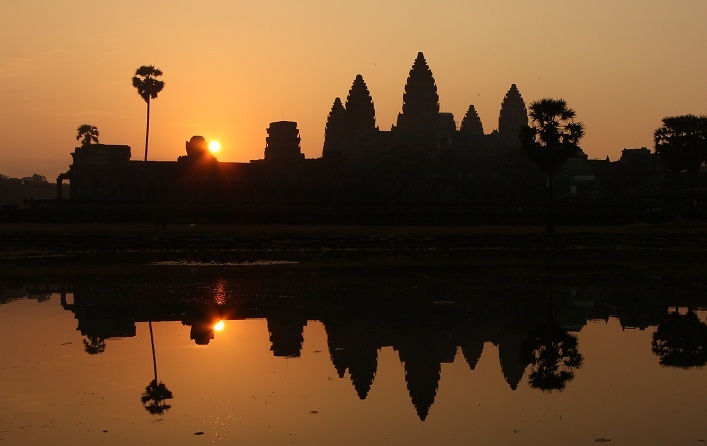 The main draw to Cambodia is Angkor Wat, an impressive temple complex built in the 12th century. The king built it to serve as the state temple and the capital city. 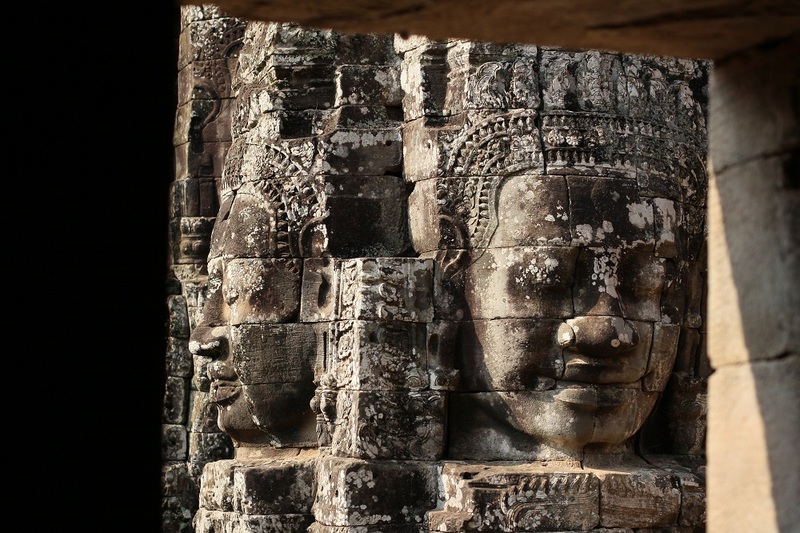 Originally Angkor Wat was dedicated to the Hindu god Vishnu, but since then has changed allegiance to Buddha. The temples are way spread out, so the typical mode of transport is to hire a tuk-tuk driver for the day. The driver takes you to the various temples and waits (for what could be hours!) for you to return. While certainly relaxing for the drivers, who took advantage of the down time to just sleep away the day, it looked like the most boring job ever. We spent two days exploring the amazing temples. 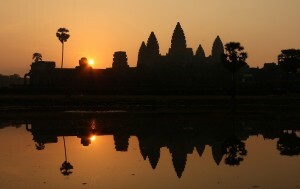 On day two we watched the sunrise over Angkor Wat. Then we headed to the Bayon ruins, known for their bas-reliefs (sculptures on the walls), and stone faces (of some Hindu deity that looks strikingly like the king who had the temples built). So cool! 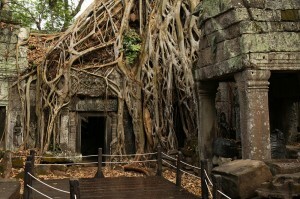 While each temple had it’s own unique style and atmosphere, our favorite was Ta Prohm, which was actually featured in the movie Tomb Raider. Massive trees wrapped their ever-extending roots around Ta Prohm as the jungle tried desperately to reclaim the space taken over by the temple. Absolutely amazing. I’ve never had so much fun exploring ancient ruins. Angkor Wat quickly swept me off my feet and leapfrogged its way to the #1 top site I’ve experienced this year (for those who are curious – it’s still behind Machu Picchu!) . Matt rates it a close #2 behind Petra. Written by: kate on March 23, 2012.on April 8, 2012.